We’re absolutely thrilled to announce that Almond Breeze New Zealand has partnered with the extraordinary and talented Matilda Rice as our Kiwi brand ambassador. Matilda became universally adored when she stole Art Green’s heart on New Zealand’s first ever The Bachelor TV show in 2015 (we’re pretty sure a broken wrist had something to do with it…). 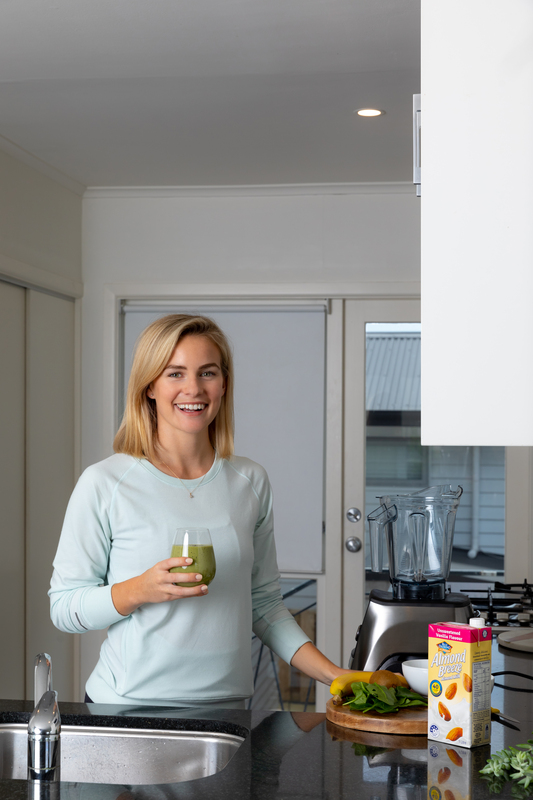 Nearly four years later, the now engaged 28-year-old brand new Warkworth resident is known for her vibrant, healthy lifestyle and effortless charm, so it made perfect sense to bring her into our Almond Breeze family! “I personally don’t do well with dairy (although I’m partial to a bit of cheese now and again), so find almond milk the perfect alternative,” she says. 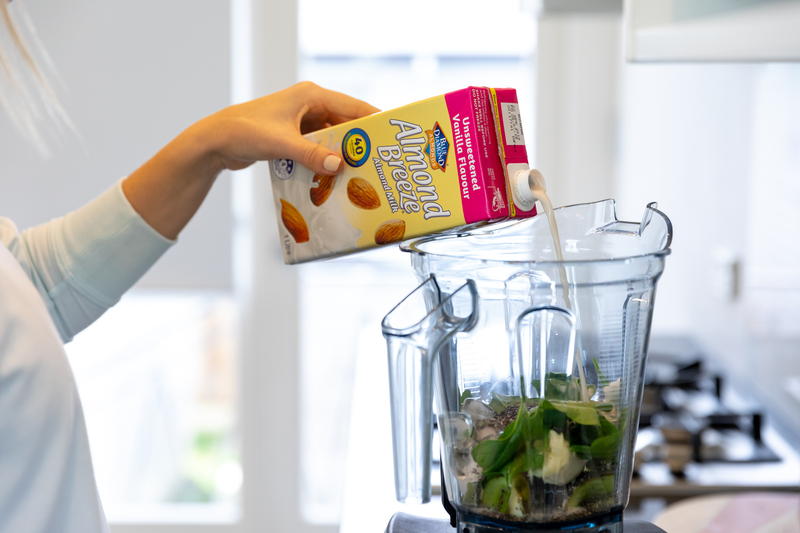 As part of our partnership, Matilda is sharing some of her favourite recipes in a video series throughout the year to showcase how she uses Almond Breeze almond milk and just how versatile it is to use day-to-day! 1.You’re well-known for embracing a Paleo diet. For our readers who are not 100% familiar with Paleo, what is it? What excites you most about it? And how does it make you feel? Paleo is short for “palaeolithic” which essentially means relating to the stone age. The paleo diet is all about eating the way our cavemen predecessors ate (and what they had access to), which means fresh vegetables, fruit, nuts, meat, fish, seeds and eggs. In the modern world it’s much easier to look at it as a way to eat as naturally and un-refined as possible. I love this diet as it’s not difficult, I can still have all the foods I want, and I honestly feel incredible. When I started eating this way I had more energy, my mood was better, and I started sleeping like a baby! 2. You probably have loads of lifestyle tips that make you feel fab, but what are your own personal top THREE foolproof ways to live your best life that are a bit outside the box? Practice gratitude. It’s really easy in the western consumer-driven world to always be aware of the things you DON’T have, especially with social media thrown in the mix. But it’s quite rare that we focus on what we DO have (which is a lot). I make a conscious effort every day to be grateful for everything I have, and the experiences I get to go through. Even if they are small, like smelling the flowers in my backyard or my morning coffee. As soon as I started practicing this every day I realised what truly makes me happy. It’s not “stuff”, it’s human experiences, and the constant gifts from nature that we take for granted! Surround yourself with like-minded people who lift you up. When you are around your kind of people, you should feel happy, relaxed and calm. Don’t waste your energy on people that bring you down or don’t make you feel great! As soon as I started focussing all my energy in to my kind of people, the toxic relationships slowly dropped off, and it’s one of the best things I have ever done! Treat yourself. Listen to your body! I feel like we are always go-go-go, so I love taking some time out every now and again just for me. Whether it’s going for a hike, getting a massage, heading to the beach with a good book, I like to take time out and connect with myself again. 3. Why did you choose to partner with Almond Breeze? And has it been easy to integrate Almond Breeze almond milk varieties into your diet? I’ve been drinking Almond Breeze for the last 7 years or so ever since I started experimenting going dairy free when I was living in London. The taste and versatility hooked me in at first, but I stayed loyal because I discovered it’s a family business in California! 4. What are you MOST excited about in 2019? I’m so excited to smash new goals, settle in to life in Warkworth, and renovate our new house! 5. Do you have any lessons you learned from 2018 to share with us? I learned to always be open. To everything! The more closed off you are to opportunities, the smaller your world becomes. I now thrive on meeting new people, and trying new things, whereas I used to be a little more closed off! 6. Loads of people have issues around body image and what constitutes body beautiful. We’ve followed your journey from The Bachelor NZ to today, and no doubt getting on the runway for Jockey was a momentous personal challenge. So what would you say to people about loving the body they’re in? I think the ultimate way to love your body is to look after it!!! It will pay you back in spades, and your relationship with your body will become much more positive. As soon as I stopped thrashing my body with crash diets etc to try and “fix” problem areas, and started treating it with love and respect, nourishing it with fresh food, and moving it, the better it worked, and the more I realised there are no problem areas. There is just your beautiful body doing the best it can at all times! 7. What’s your no. 1 fave Almond Breeze almond milk flavour and why? My favourite everyday flavour is the Almond Breeze Unsweetened Vanilla Almond Milk. Since I have a smoothie pretty much every morning, it complements it really nicely. For a bit of a treat, my other favourite is the chocolate (ours too!!!). It’s really nice with chia seeds as a wee pudding! 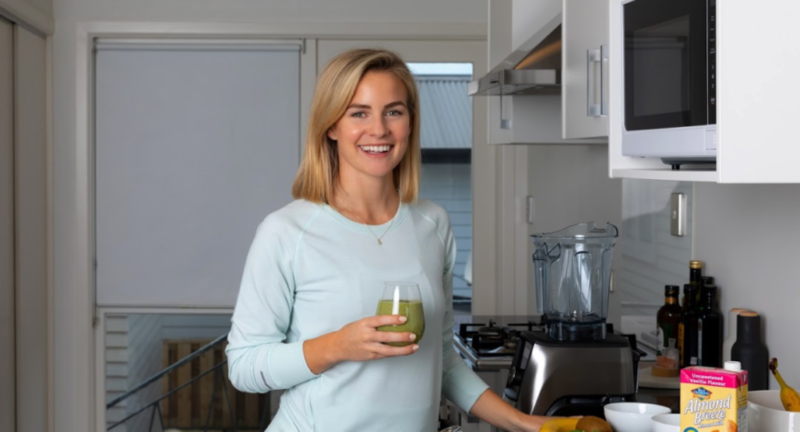 Thanks Matilda for sharing one of your fave healthy smoothie recipes so we can all kick off 2019 just right! Blend everything in a blender until smooth, pour into a chilled glass and serve with a sprinkling of chia seeds. Enjoy after your workout (or a brisk walk around the block) and get those gains! !